I have thought for quite a while now that some of my designs would translate well into hand embroidery designs, it’s taken a long time to get around to this but there are finally here. I’m starting small with just a few patterns, and of course I have to start with my Pug designs as they are some of my favourites. 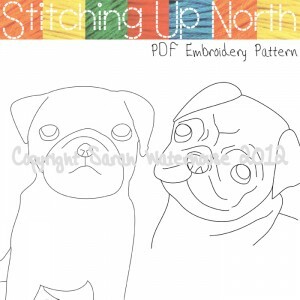 There are two patterns in my new Etsy shop, Stitching up North, both are PDF patterns so available very quickly which means that you can start stitching right away. 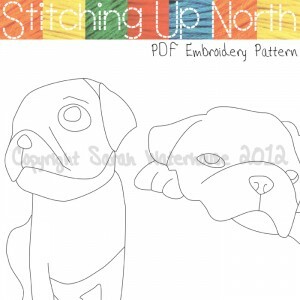 Each design includes 2 adorable pugs in two sizes for your stitching convenience, here’s a sneak peak. Now I have to stitch up the patterns so I can show examples of the finished designs in my listings, it might take me a few days but I’ll post them as soon as they’re done.